A vision of Digital India is incomplete if our citizens are not able to lead a healthy life. Leveraging the power of Internet and Mobile, Government of India has proposed a massive digitalization drive in the health sector, which will result in access of information and knowledge about various health schemes on finger tips. Health Minister J.P. Nadda, while inaugurating the National Health Portal in Shimla said that information and details about major health programs initiated by the Govt. such as immunization drives and mother and child care would now be available on mobile apps and mini mobile portals. These standalone apps and tools would be directly linked with the National Health Portal which was launched in November last year. Hence, the end user can get information and program details right on his mobile phone, and we aware of the important dates wherein the Govt. conducts special events. Last week we had reported that India has launched a massive health education program aided by Digital India vision. This new development can be considered as an extension of this campaign. During the same event in Shimla last week, Minister Nadda said that Govt. of India will observe and celebrate Yoga Day on June 21st, which will be a major awareness campaign towards healthy living. Special focus would be on prevention of lifestyle diseases such as diabetes and blood pressure, and to help education about the advantages of doing yoga. Govt., in collaboration with NGOs will conduct around 500 workshops and camps to teach Yoga, all over the country. Last year in November, J.P. Nadda had formally launched National Health Portal during the International Trade Fair in New Delhi. This portal was conceptualized and developed after National Knowledge Commission suggested the Health Ministry that Indian citizens need a single access point for authenticated and genuine information related with various health programs launched by the Govt. In addition, National Institute of Health and Family Welfare (NIHFW) has established Centre for Health Informatics which will administer this heath portal, and update it with the latest information and data. With the new announcement from Minister Nadda, digital experts are speculating that the Govt. may propose to create individual applications and mini-portals pertaining to each program. 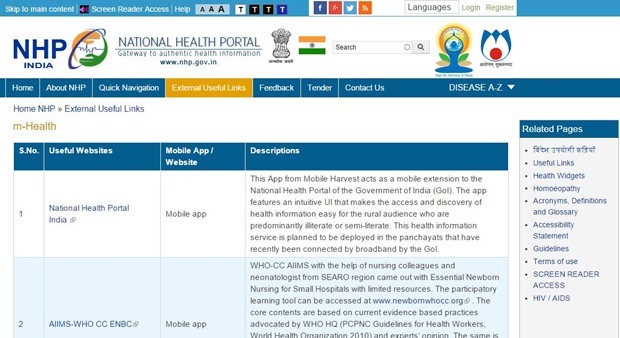 You can access all the apps provided by National Health Portal here. Users can also view latest health advisory and notifications shared by the health ministry on the portal here.